Someone left tangerines and chocolate on my refridgerator-shelf. Old tangerines. The chocolate was in German so I suppose it was the German girl’s before she moved out. Chances are they are poisoned though (no I didn’t like her, how could you tell?) but I took the risk. It’s been over a day since my “Thanks for the food but put it on your own shelf or I will eat it up”-note on the board. The chocolate was good and Rättvisemärkt (German-style) but who buys 35%ish chocolate? What’s the use of buying healthy chocolate anyway? And I caught a cold. Luckily, I bought one of those disposable masks! It make you look like Hannibal Lecter. 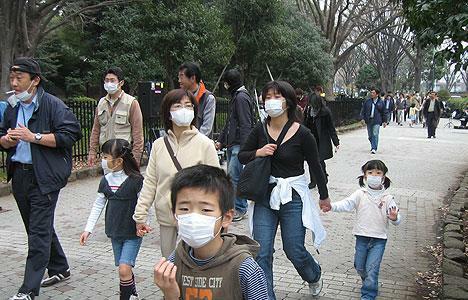 But the reason I bought the mask is because of my one of my sisters – some Koreans believe that the masks will give protection against flus and colds instead of protecting others from the wearer’s disease. My sister wears her mask whenever she goes outside. I hope she remember to wash her hands too. Anyway since the mask is designed to protect other people from a sick idiot’s sneezing right out into the open, if the flu is air-borne it will still be able to creep inside the not-so-tiny gaps between the mask and the chin. There are supposed to be good masks out there which filters the air and stuff. Maybe something for people with allergies, like cat-lovers? Japanese wearing masks/cosplaying as Hannibal Lecter. I think this is the first time a Japanese has appeared on this blog.